The award-winning comic convention Stoke Con Trent will be bringing a series of special guests to the city including a treat for Whovians ( Fans of Doctor Who). 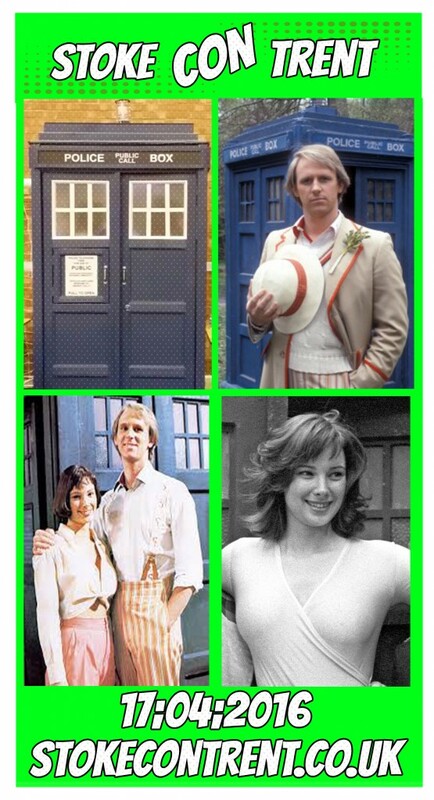 The Tardis is set to re materialise at Staffordshire University on April 17th at 10 am and stepping out from it will be the Fifth Doctor Peter Davison and his glamorous assistant Nicola “Peri” Bryant. They will be joined by Tessa Peake-Jones who appeared in the 2013 Christmas Doctor Who show called “The Time Of The Doctor” although Tessa is more famously known as Raquel from Only Fools and Horses. “this is our fourth convention and each one seems to attract better guests and more visitors. We had some great recognition from the Comic Conventions Website who’s visitors voted us as the best convention of 2015, which considering some of the national and international events that took part was a brilliant achievement. Attendees will be able to meet the guests, have photographs and purchase memorabilia and Autographs from the guest. The convention will have over 20 guests in total along with many specialist traders and exhibition stands.